Richard B. Hays began his work of examining how the earliest followers of Jesus were interpreters of scriptures in 1989 with his work The Echoes of Scriptures in the Letters of Paul. Twenty five years later, after changing the dynamic of the way many people view Paul’s engagement with the Hebrew Scriptures Professor Hays now gives us a short introduction into what he states he hopes will be a much larger projects examining each of the evangelist’s engagement with the scriptures, but this short and provocative work should help continue the conversion of the imagination he challenged his readers to see in Paul now in the voice and words of the authors of Mark, Matthew, Luke and John. The book is the adaptation of the Hulsean Lectures presented at Cambridge University in the fall of 2013 and the spring of 2014 and is a work that will encourage its readers to understand the manner in which these early evangelists use the Hebrew Scriptures prefigure their experience of Christ. The relationship of the Hebrew Scriptures to the New Testament is an important question for the church, but one that has often been overlooked. Richard B. Hays invites us into an exercise in learning to place ourselves in the evangelists’ places and see these scriptural texts that they used through their own eyes. Dr. Hays is convinced that “the Gospels teach us how to the OT, and –at the same time—the OT teaches us how to read the Gospels.”(4, emphasis author’s) Rather than seeing the evangelists as proof-texting pieces of the Hebrew Scriptures to make a certain points but rather invoke a set of rich and intertextual relations between the experience of the words of Jesus and the experience of his followers with the vision and world presented by the portions of scripture that the evangelists cite or allude to. The readings of each of the four gospels that are presented in Reading Backwards provide a rich and concise with the way in which each gospel distinctively uses scripture to paint its picture of Jesus. The Gospel of Mark tells a story that is more suggestive and allusive in its narrative style and likewise many of Mark’s uses of the scriptures are allusive as well. Mark rarely quotes scripture but frequently uses language that alludes to how Jesus’ work and God’s work are mysteriously linked. Mark intimates that Jesus is, “in some way that defies comprehension the embodiment of God’s presence. Mark never quite dares to articulate this claim explicitly; it is too scandalous for direct speech. For Mark the character of God’s presence in Jesus is a mystery that can only be approached by riddle-like allusions to the OT.” (19f.) By looking at the way Mark creatively cites and alludes to scripture from the beginning of the story in Mark 1: 2-3 and running through the crucifixion narrative examining the way the larger context of the scriptural allusions to open the readers to the mystery of Jesus’ relationship with the God of Israel. Mark’s characteristic tension holds this identity in suspension as well, never overtly coming out and claiming Jesus’ identity but rather in a poetic way hides this answer in order that it might be revealed to those with eyes to see and ears to hear. Mark attempts to lead his readers into an exploration of the mysterious way in which Jesus is recognized as the embodiment of the God of Israel. The Gospel of Matthew is much more explicit in its claims and the ways in which it uses scriptures. Matthew quotes scripture explicitly more than any of the other evangelists and from his first citation of Isaiah 7.14 in the birth narrative where Jesus is titled God is with us until the end of the gospel where all authority has been given to Jesus who will be with them forever Matthew presents, in a much more direct way, that Jesus is the presence of God among the people and the appropriate response is to worship the living presence of God who is present with them. Matthew uses a combination of scripture quotations as well as allusions to the Old Testament stories, like Herod in the slaughter of the innocents certainly would be heard as echoing Pharaoh’s decree in the Exodus narrative, to show how Jesus comes to embody not only God’s presence but also comes to be the fulfillment of the hopes of the law and the prophets. Where Mark encourages us to explore the mystery of the way divine presence of the God of Israel is present in Jesus, Matthew wants us to see this presence in order that we may worship God where God has now been found. For John’s gospel the fundamental hermeneutical claim is that the scriptures are the ones that bear witness to Jesus, but to understand those same scriptures one must first come to Jesus to receive life. This retrospective reading of Israel’s scriptures allows John to use a more visual set of images and figures from the narrative of the people where Jesus through verbal echoes and direct quotations link Jesus with both the wisdom of God as well as the images of the temple and sacrifice. Through these images John wants to illustrate that Jesus is not only the temple—but also the place where God’s presences comes to meet us and deliver us into union with the divine presence. (82) Since John understands Jesus as the Logos of God the entire narrative, the temple, sacrifice and the festivals of Judaism are a rich set of signs and symbols of God’s activity in the life and presence of Jesus. In this short work with numerous illuminating explorations of the way the evangelists read their scriptures and the scriptures provide a fuller meaning to the telling of the story of Jesus, Richard B. Hays invites the reader to discover a gospel shaped hermeneutic. This, he argues, involves a complex poetic sensibility that pays attention to the narrative arc of the scriptures. Hays argues that the more we explore the way the evangelists explore the scriptures the more clearly it is apparent that each of the evangelists in their own unique portrayal point to Jesus being the embodiment of the God of Israel. This short work, which continues Richard B. Hays long work with intertextuality and the art of reading scripture, is a very generative and helpful introduction to the deep question of how the evangelists became interpreters of the scriptures and how the experience of Jesus reframed their reading of scripture while scripture gave them the language and symbols to express the mystery of who Jesus is to their communities. 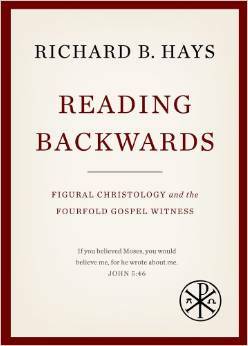 This entry was posted in Book Reviews and tagged Interpretation, Intertextuality, John, Luke, Mark, Matthew, Reading Backwards, Reading Scripture, Richard B. Hays. Bookmark the permalink. Thanks for the summary on the book. Ive had a few people suggest this and it sounds awesome by you review here. Cant wait to read it.